In the tradition of Operation Bumblebee and Operation Ice Cream Cone, I bring you Operation Pizza Roll. Okay, that does sound pretty dramatic and silly, but I assure you that this is quite serious. I also suggest that you will have a much better understanding of what I’m going to tell you if you take a few minutes and familiarize yourself with Bumblebee and Ice Cream Cone first. Before I get to the goals, operation, and results, I should remind readers what the difference is between a cold reading and a hot reading. A cold reading is when a psychic (medium) does not know you, but “reads” your body language, appearance, and reactions to usually very general statements that fit most people; statements such as “You have always wanted to write a book” or “Your father used to say things that would embarrass you when you were young.” Cold reading can happen over the phone, by text, and even more successfully in person. No matter how hard you might try not to give feedback to a psychic, you will probably do so inadvertently. A hot read is when the psychic has information on you beforehand. Someone might have overheard you talking in the waiting area, they might have been given information from your friend that suggested you get the reading, or someone watched you park and exit your car in the garage, and so many other methods. Possibly they might have your name and did an internet search or a Google reverse image search. Or you paid with a credit card or used Paypal, or they found your information on social media. There are many ways to get a hot reading on someone. To catch a psychic in a hot read is very difficult. The majority of psychics I’ve come in contact with usually cold read their way through the reading. With practice and just by paying close attention, most everyone can cold read convincingly. Operation Bumblebee and Ice Cream Cone were elaborate stings to catch a psychic in a hot read, but in both cases, we were only able to prove the cold read. If you ask an expert on psychics such as Mark Edward, he will tell you that psychics are just lazy, especially when doing a group reading. Using the law of large numbers, if a psychic on a stage throws out some vague statement to an audience of 200 people, someone is going to claim the reading for themselves. If the psychic starts to miss, they just move to a person nearby and continue. People such as myself and Mark Edward, who have been interested in psychics for many years, know that with the invention of social media as avenues open for gathering information, hot reads are easily available. In fact, if an up-and-coming psychic superstar who isn’t already banking a six-figure income doesn’t take advantage of internet search applications, they are missing out on a great opportunity to increase their “hits” to maximum level—no matter how distasteful that may be to mention here. Purchase your ticket to see the psychic online and then share on Facebook or Twitter that you will be attending the psychic show and in seconds the psychic is now aware of your social media feed, as well as all the content you put on it. The psychic only needs a few “ringers” in the audience to get the gasps of wonderment and bring in the book sales and private readings, which is where the big money is. The bigger the audience, the easier it is for the psychic to hide the hot read and the harder to set up a sting to catch them. You have to have a way to control the information. Maybe Grandma also reads your social media in the afterlife and knows you lost your car keys for two days? Just because you wrote about that happening on your Facebook feed isn’t clear enough evidence for a hot read. The psychic can claim that they got that information from your own brain through telepathy or maybe Grandma told them, or possibly the psychic read it on Facebook. For a successful psychic sting, you have to have strict protocol and controls. BBC 3 did a wonderful sting on three mediums in 2007. They gave a building a fake history in a newsletter and website as well as added a plaque and photo to make the story more convincing. All three mediums fell for it and all were called out during the taping, which made for great TV. But the mediums could have claimed that they got the information from the film crew and the organizers’ minds. Everyone in the room knew the fake story. This sting wasn’t correctly blinded. Catching someone in an irrefutable hot read involves controlling the sting in such a way that the people being read don’t know the planted online information. With Operation Pizza Roll we did exactly that. It worked like a charm. Locking in a psychic in a hot read was near the top of my goal list, but even more importantly I wanted to get the skeptic community excited and interested in doing activism. This specific psychic I had never heard of and had no idea if he was hungry enough to go for the sure thing I was going to hand him on the silver platter that is Facebook. I also had to make sure that my volunteers understood that we were going to create the very sort of fiction that the psychic creates; fighting fire with fire. As much as we disliked doing so, we were going to have to hand over money. We could have purchased $65 tickets, but those people aren’t going to get a reading. VIP is the only way to get a chance to get called on. We wanted to look like we were grieving and were not living paycheck to paycheck. The psychic wants to get his/her hook in the real believers and wealthy newcomers. In this case, each seat was $125. My team understood that we were not going to expose the psychic at the venue, and it was quite possible that our actions might have made the believers in the audience into even bigger believers as attendees we were going to agree with whatever the psychic told us. Mark Edward agreed to attend the event with me. A single man in the audience is suspect as the room is generally filled with women. In most instances, there are only a few men, and they all appear to be with their wives. Edward and I became Mr. and Mrs. Wilson for the night. Seven international volunteers, Edward, and I discussed the basic plan in our secret Facebook group: Operation Pizza Roll. We only had one week to pull this off. In previous stings, we took months to prepare. We pulled old fake Facebook pages out of Bumblebee retirement, changed the names and photos and the volunteer team (now calling themselves Pizzarollers) made a super-duper secret Facebook group that Edward and I were not admitted into. At some point in the discussion the Pizzarollers were having, they decided that Susanna was going to go to a psychic. 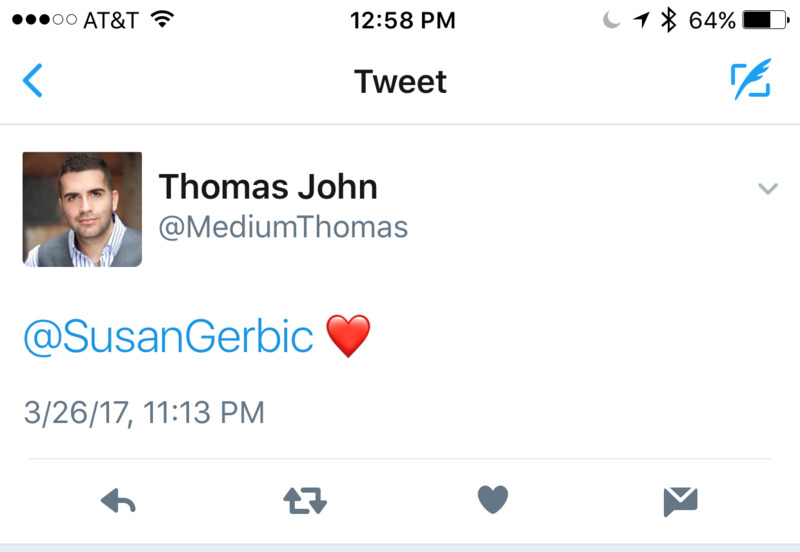 She saw a Facebook ad for Thomas John—the Manhattan Medium and tagged him on Facebook. They discussed among themselves about attending and tagged him again. Tagging on Facebook informs the psychic that there are people interested in attending one of their events and gives them the ability to link back to our social media accounts. Social media accounts that were created just for that psychic to view. 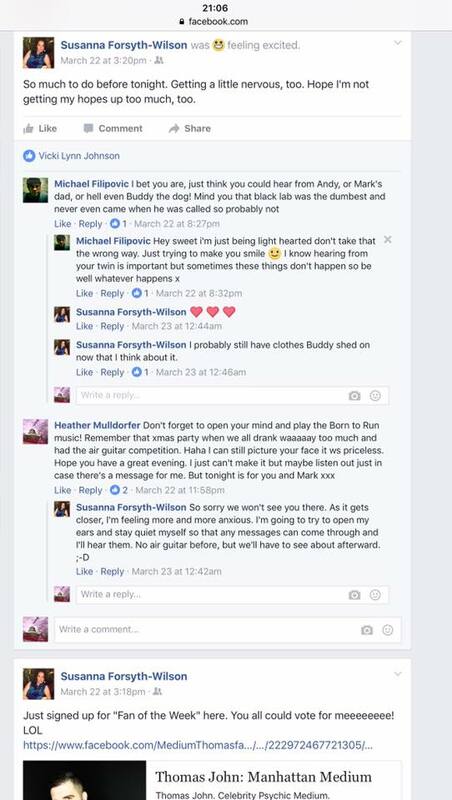 The Pizzarollers created detailed backstories for Mark and Susanna Wilson: shared cat videos, checked into restaurants, and did what they could to look like normal Facebook users. They quickly created the story that Susanna was stressed about losing her dear twin brother Andy to pancreatic cancer in 2016. Mark was upset that he did not get to say goodbye to his father who passed away many years ago, from heart disease. Now Mark was concerned that he had inherited the disease. This is all we knew when we sat down in the VIP section that night in March 2017. Just in case, Edward and I wore items that would enable the psychic to also easily cold read us. Edward had a lapel pin from the Marine Corps, and I wore a Scottish pin. We both also wore wedding bands. The venue held about fifty people. We were in the third row with fifteen other VIP ticket holders. The psychic stood on stage with his eyes closed for two hours, hardly moving at all. He took no breaks and when he felt someone was speaking to him from beyond the grave, the person in the audience who “claimed the reading” raised their hand and was given a microphone. I should add that the entire audience was given permission to audio tape the readings. After a religious deep-breathing prayer, we got started. This rushed excuse for piety seemed less than a serious attempt at injecting spirituality and more like a disingenuous qualifier for the religious in the audience. The first reading was all the way in the back row and every statement was a direct hit. It was odd how specific the statements were. It was too perfect. Edward gave me that knowing look. The second reading I need to mention because it was directly across from us, again very specific and although the woman in green (to be mentioned later) was dabbing at her eyes with a tissue throughout the reading, Edward said she wasn’t actually crying. Then it was our turn. He said “I’m getting someone’s twin” so I timidly raised my hand claiming the reading, and they brought me the microphone. He asked me if this was my brother, Andy, who died from pancreatic cancer only a short time ago. I responded very meekly, “Yes,” and pulled out tissues to dab away tears, pretending to get very hotfaced from the obviously stressful moment of hearing from my recently deceased non-existent twin brother. Edward had to get a paper from someone to fan me from time to time. What a loving husband. Our readings lasted fifteen-minutes and included Mark’s father who had died a long time ago from heart disease. The psychic picked up that Mark was really stressed over some medical tests he would be getting the results for in a week. He was told to stop obsessing over the tests, something would be changed and of course to pay attention to what the doctors say. All of this we already knew. Then the psychic started talking about things we had no idea about. Who is Buddy? I said my brother and father each had that nickname. Turns out it was my black Labrador who had died, and Steve kept getting mentioned, but we stumbled over how to answer who it was. I said we knew many Steve’s and thought it might be a close friend of my brother’s. We found out later Steve was Mark’s father. Who is Maria? I said it was Andy’s girlfriend. It was Andy’s wife, and she was holding a small box that I needed to get from her. Who smoked and quit and started up again? Was it my brother Andy? Relieved to be led to the right answer, I agreed that it was. 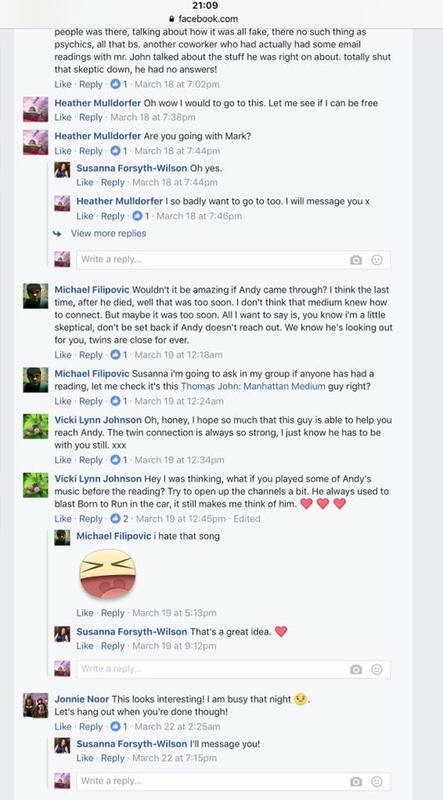 Apparently, Andy is going to connect with me with music that we shared in common. What is the connection with Michigan? I had no idea what to say so I said we had lived there at one time. Also, Andy is on the other side with dogs. This went on with a few more details thrown in, we had no idea what was on the Facebook pages, so no idea how much he had read past the general information Edward and I were given by the Pizzarollers. We knew we had confused the psychic with some of our answers. How did I not know my beloved dog was named Buddy? And Edward didn’t know his father’s name was Steve? We blundered through those parts of the reading, but by then we had proved conclusively we had no idea what was on the Facebook pages and the psychic did. And the only way he could have known that information was to have read it on Facebook. Hours later we were able to tell the Pizzarollers what the psychic said and sent them audio of the reading. They shared screenshots from the pages showing how correct the psychic was about our backstories. 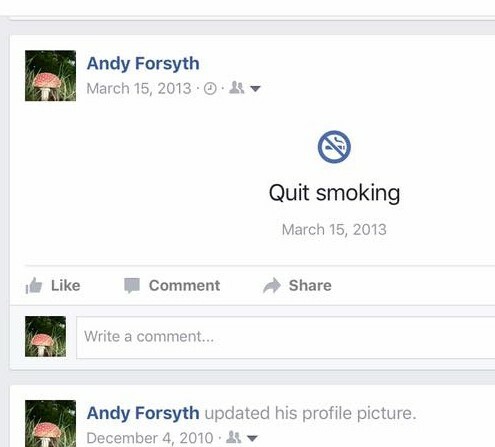 Several of the statements made by the psychic confused them, they started looking over other Facebook accounts and discovered some posts that they had made but forgotten about, like when Andy had made a Facebook life event for when he stopped smoking in 2013 and someone congratulating him on his marriage to Maria. The Michigan statement was really confusing. One of the Pizzarollers noticed a photo someone had put up, just a random photo meant to be a filler. It was of a building in a park, the caption reads “Frenchman Creek, Cornwall,” which is in England. The psychic had asked if I had any connection to “overseas” and I said “well, yes” but wasn’t specific. Turns out that if you do an internet search for “Cornwall Creek,” you will discover it is in Michigan. The VIP pass included a twenty-minute meet and greet with the psychic, where we were going to get a free signed copy of the psychic’s latest book, Never Argue with a Dead Person: True and Unbelievable Stories from the Other Side. Before we got up from our seats, a woman from the audience came over and said how nice it was that our family came through for us. I asked her if she also got a reading tonight. She said she had and was delighted that this time her grandmother had come through, not like the last time when he gave her a reading. What? Yep, she was also a hot read. She told us that she had attended a small event that included all ten people getting a personal reading not so long ago. She wasn’t even suspicious. It was really sad to see her so caught up in it. During the meet and greet, everyone was handed a copy of the psychic’s latest book. The psychic walked among us asking our names to personalize the book. When he got to the woman in green previously mentioned, she handed the psychic the book and joked to him to “spell it correctly this time.” It seemed odd to us that the psychic didn’t need to ask this person their name but asked everybody else. After getting our books to Susanna and Mark signed and a selfie with the psychic, I asked if there were other mediums he respected. We were given a few names of people we had never heard of. Then were told of a “few students that were really promising.” I asked, “Students? You have students?” After answering in the affirmative, the psychic pointed to two women sitting with us in the VIP area. One of them was the woman in green whom he had given an amazingly detailed reading to and who Edward had flagged as a fake tear dabber. Wow! It appears the psychic did indeed have a promising student and one who was very well trained. In mentalist circles, this is known as a stooge or “plant.” No one in the room seemed to pick up on that. The day after the event, the Pizzarollers were busily going through all the audio and looking at the Facebook pages, and found during searches that our psychic has a criminal history. Apparently, he was a performer in Chicago using the name “Lady Vera Parker” in 2009 when he was arrested and jailed for taking security deposits on Craigslist for property he did not own. He had many different aliases and, according to an 800Notes website, has had the Chicago police asking for more information from people who had fallen for his scams. I did call the phone number listed and it was indeed the Cook County police department. We found several other gossipy style websites that talked about his police record and other events. In 2016, the New York Daily News reported that a California PR company was suing Thomas John for not paying for their services. According to the court records the Daily News had, the firm ZTPR had been hired to “help him build and exaggerate in the press his public profile as a believable psychic medium”. Yelp reviews are mixed, five-stars that love him, others give him one-star reviews. Several mentioned that they felt that the information they received was from an internet search for the name on the account of the person who purchased the tickets. Others say that there was “no way he could have known all the information he relayed.” One of our favorite phrases we hear frequently. Some were savvy enough to say that they hadn’t posted all that much information on social media so didn’t think he could have found iy there. One really odd thing happened to me a couple days after the event. I had not mentioned publicly to anyone the name of the psychic. I did talk about doing a successful sting on my Facebook page, but without mentioning his name how would he know to look on my page. 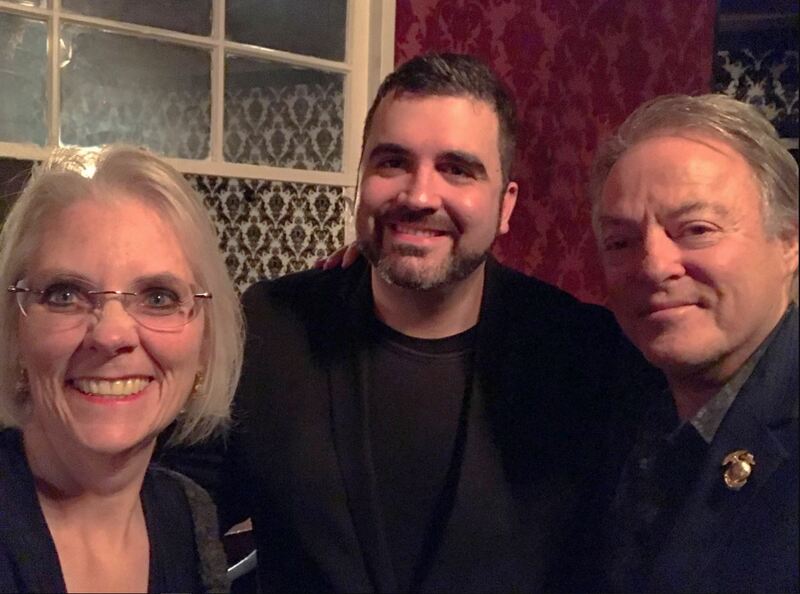 Still, I made sure that the post was hidden for “friends only.” I received a tweet from the psychic to my Susan Gerbic Twitter feed with only a heart. He figured it out, by tweeting to me, he was letting me know that he had seen through the Susanna Wilson persona. But how? The only two options I can think of were that he is truly psychic, or he figured it out from Susan Gerbic purchasing the tickets for Susanna and Mark Wilson over Paypal. So now we end, if you would like to listen to Mark and Susanna’s reading it is here for your listening pleasure. Remember that we are stumbling through this reading as we only knew a tiny bit about what was on those Facebook pages. Thank you Mark Edward for your help with this article.